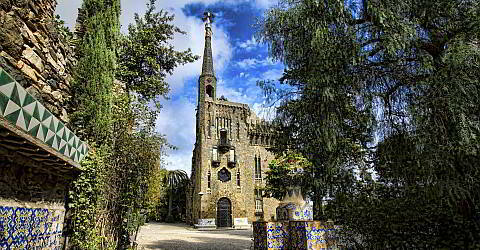 The Torre de Bellesguard is one of Gaudí's works that is attached only little importance. For sure without good reason, since you can see several elements in the Bellesguard, that he perfected in his later works. Gaudí executed a tribute to the middle age with this extraordinary residence that used to be King Martin's summer residency from the 15th century. Here you can book a sightseeing tour with audio guide in English. You will learn many interesting things about the architectural construction of the building and its historical development. Look at the primarily created viaduct, which reminds of Park Güell and which Gaudí built out of the ruins of the medieval palace. Also pay attention to the beautiful gardens with its special ergonomically formed long bench. Sightseeing of the outdoorfacility with a narrow description of the history of the house starting in the medieval age as well as a description of the diverse architectural elements of the house. With the audio guide you can move about freely at the outdoofacility. Sightseeing of the house every 30 minutes with a person, that accompanies the group through the interiors, the attic and the terraces. Essential parts of the sightseeing are only accessible over narrow stairs. The outsidefacility partly lead along uneven paths. Simply enter the number of people, that you would like to book for on the right. A free cancellation is possible within 8 weeks after booking, and by no later than December 31 of the respective year. There are no cancellation or handling fees, you will receive a full refund of the amount payed. A requirement is that the voucher wasn't used. You can cancel really easy via e-mail by stating your booking code. Please enter the desired number of tickets. Immediately after booking you will receive the voucher with which you can visit the building.